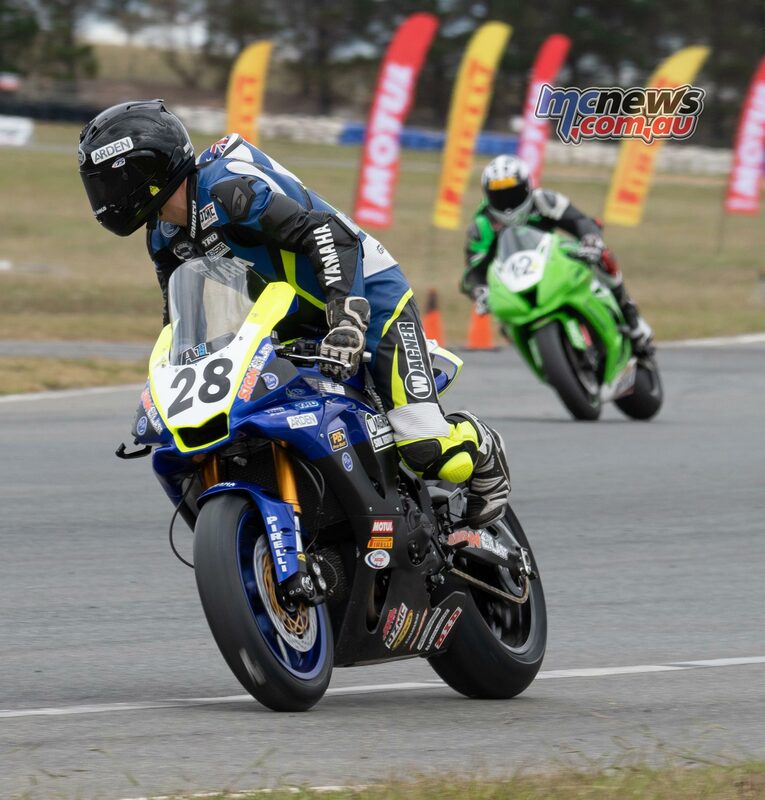 ASBK Round One winner and thus championship leader Aiden Wagner had a major tumble on Friday and is struggling for speed. 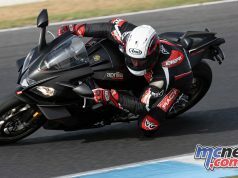 Wagner had been baulked by a number of riders that were, erroneously, let out of pit-lane right in front of him on Friday as he barreled down the main straight at full pelt. It is fair to say that it will be a damage minimisation exercise for the Queenslander here today. While short, the Wakefield Park circuit is really quite physically draining, especially over the 20-lap race distance ahead of competitors today. Starting from the head of the third row, Wagner would be forced to play the long game and hope his competition burn up their tyres and come back to him late in the race. 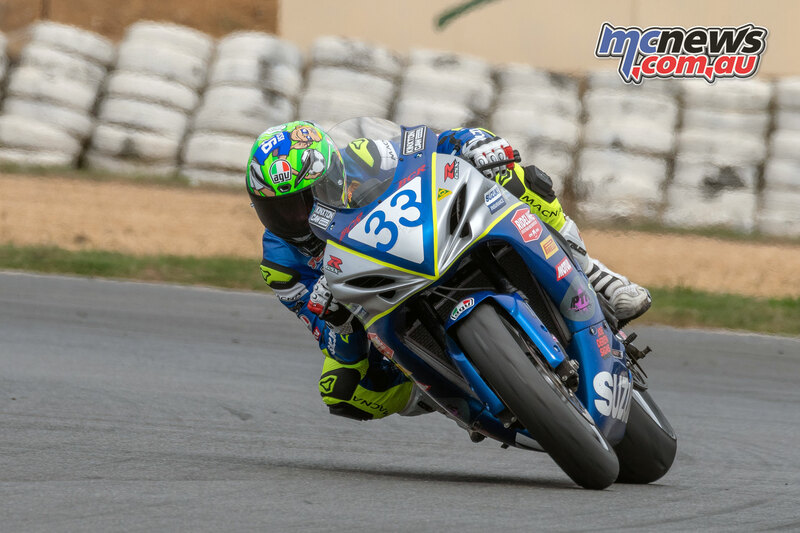 Cru Halliday was rewarded with a promotion back up to the YRT Superbike squad after winning the Supersport Championship for them last year. 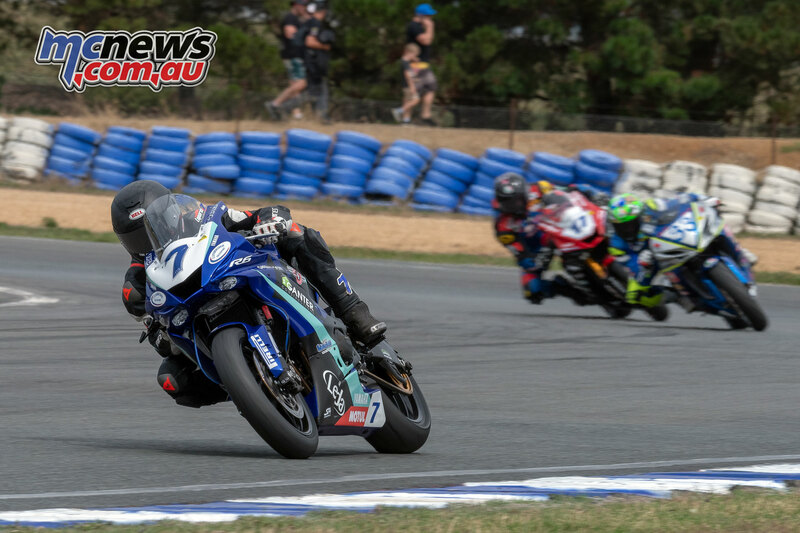 He returned good enough results at the season opener to claim second place at Phillip Island and another point to his championship tally with pole position yesterday. 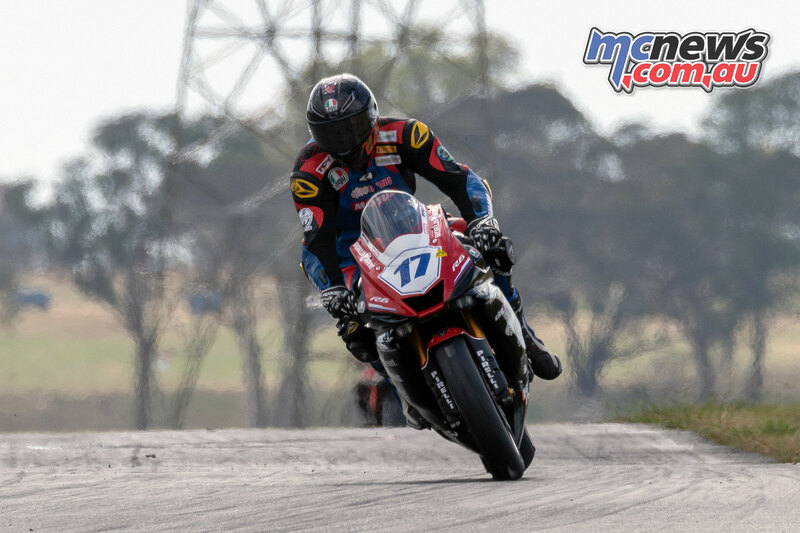 With Troy Bayliss not able to compete due to the finger injuries he sustained at Phillip Island, he is being able substituted on the DesmoSport Ducati 1299 Panigale R Final Edition this weekend by Mike Jones. 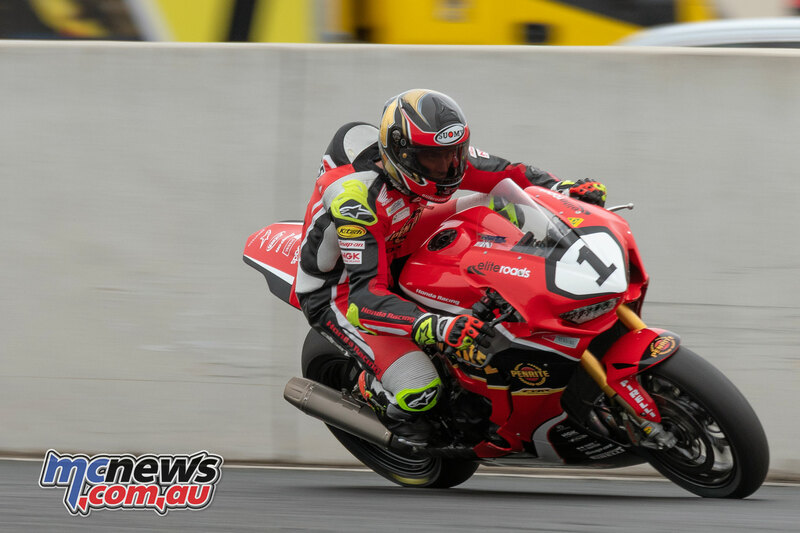 The Queenslander was looking comfortable and while not managing the pace of that top three in qualifying, he might prove to have good race pace. Joining Jones on the second row was Daniel Falzon and Josh Waters. Over race distance any of that trio could upset those front row starters here today. Likewise Bryan Staring, the only Dunlop runner in the top ten, had nowhere near the qualifying pace of the front runners, but could prove strong in the latter stages of the race. 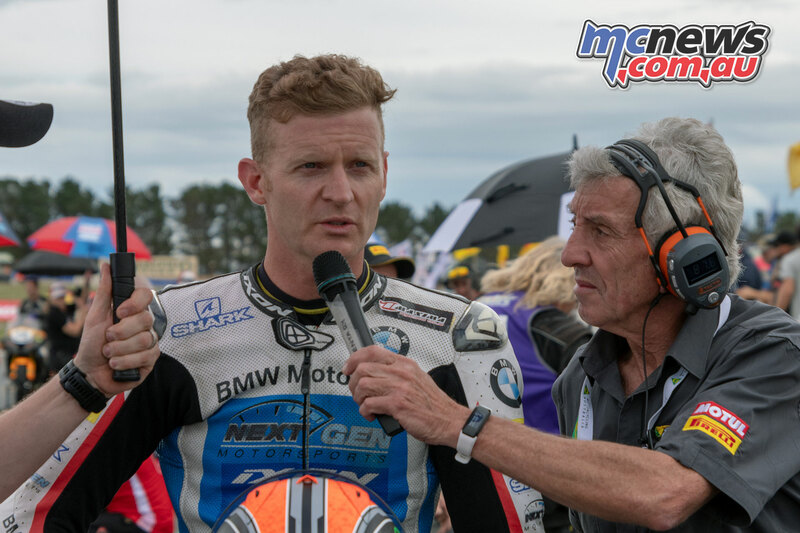 NextGen BMW and Glenn Allerton have been chasing set-up all weekend and if they make some sort of break-through, could also figure towards the end of the race. Throwing in yet another ingredient to that heady mix was the few light drops of precipitation starting to fall sporadically around Goulburn… That wasn’t dampening the spirits of the crowd though. 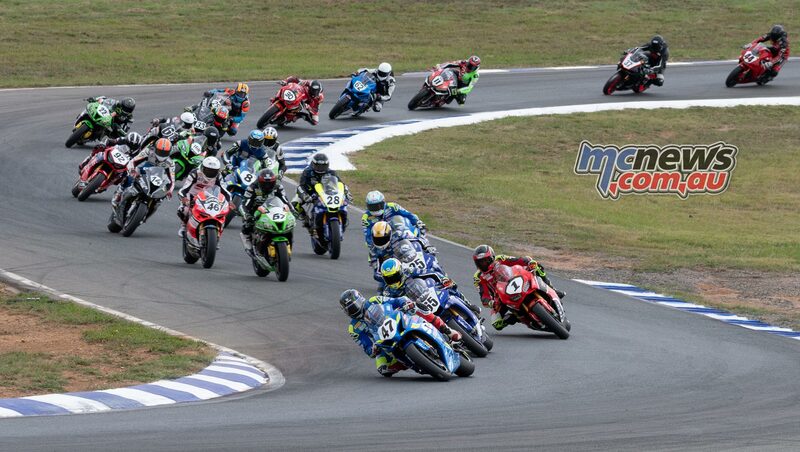 A great turnout for this second round of the 2019 ASBK Championship here at Wakefield Park. The 2.3-kilometre circuit remained dry when the lights went out and the field got away cleanly. Wayne Maxwell had the nose of the Suzuki in front as they went into the first turn what looked like about ten-wide. 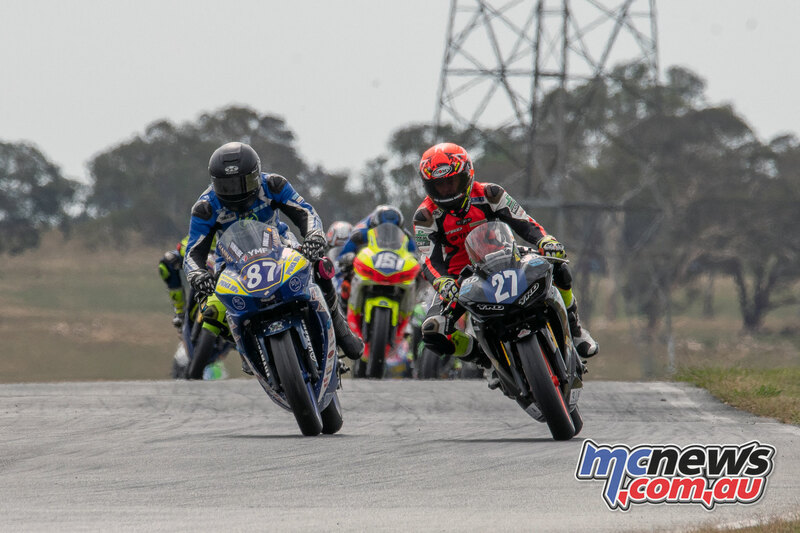 Maxwell retained that lead around the back of the circuit as Cru Halliday settled in second place, Troy Herfoss third and Daniel Falzon in fourth place ahead of Josh Waters, Bryan Staring and Mike Jones as they completed the opening lap. 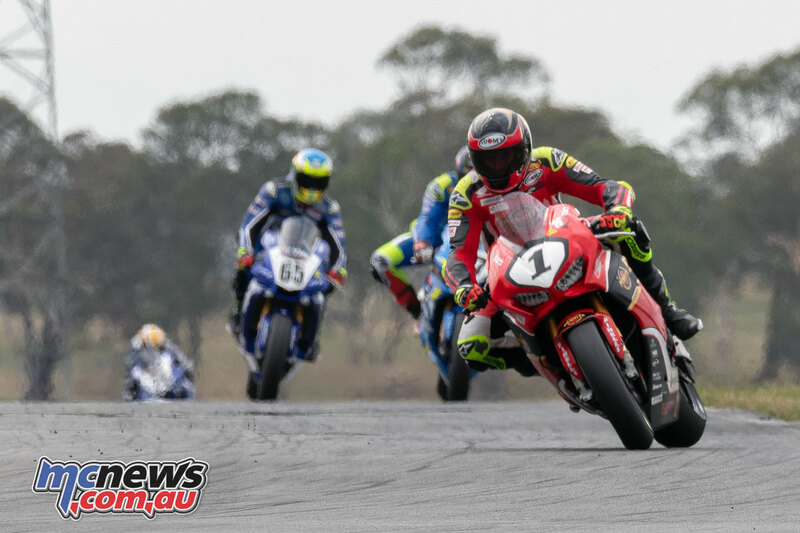 As the race progressed the top quartet of Maxwell, Halliday, Herfoss and Falzon had eked away from fifth placed Josh Waters. Championship leader Aiden Wagner was getting shuffled back through the field. That Friday crash taking its toll and his shoulder popping out of its joint once again. 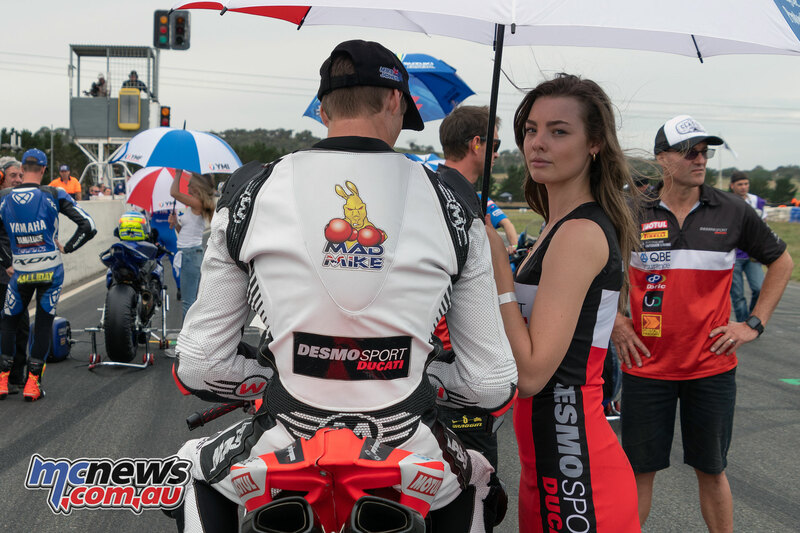 A very forlorn sight for his supporters and all of us involved in ASBK as he was forced to retire from the race. Herfoss made his move on Halliday with 14-laps to run and then dropped in a 57.527 to close right onto the tail of Maxwell. He then backed that up with a 57.525. That pair were now stretching away a little from the YRT duo. Falzon moved up to third place after Halliday made a mistake on lap nine and was looking very aggressive and determined with his body language on the YRT machine. As the race broached the half-way mark Herfoss was still all over the back of Maxwell. Herfoss made his first move as they negotiated a back-marker on the next lap, but struggled to get the Penrite Honda stopped which allowed Maxwell to get better drive onto the main straight to re-take the lead. A couple of laps later Herfoss pulled the same move but this time managed to stay ahead of Maxwell down the chute to cross the line with the nose of the Penrite Honda in front. 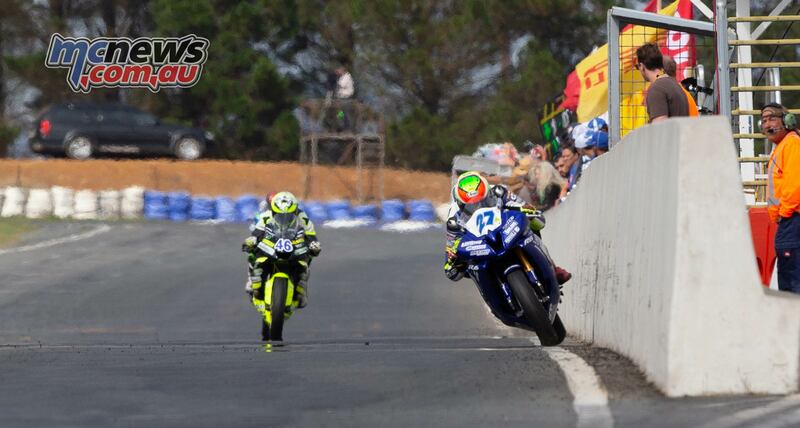 Cru Halliday had got back in front of Falzon and started to pull away from his team-mate as the laps counted down. With five laps to go Herfoss had built a few bike lengths over Maxwell. The Suzuki man had drifted back into the 58s while behind him Cru Halliday had a sniff, and re-doubled his efforts, forging his way towards the back of Maxwell’s Suzuki. By the final lap Halliday was now all over the back of Maxwell and challenging for that second position. Herfoss was looking clear and safe but the battle for second was far from done. Halliday up the inside into the final double-right and somehow manages to gather the Yamaha up and close off the corner well enough to leave a fat layer of Pirelli onto the main straight and with it second place. A clear victory in the end to Herfoss and a fast finishing second place for Halliday. The YRT man now takes over the championship lead from Wagner. 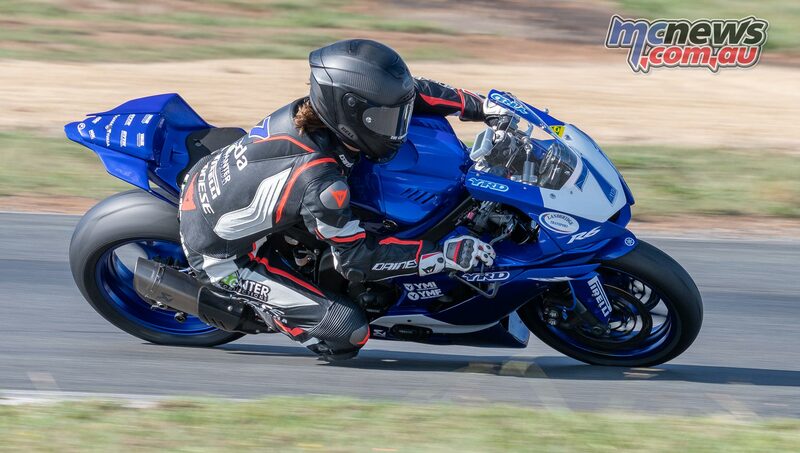 Could anybody touch local teenager Tom Toparis today at Wakefield Park? On the form guide it woud seem quite unlikely. 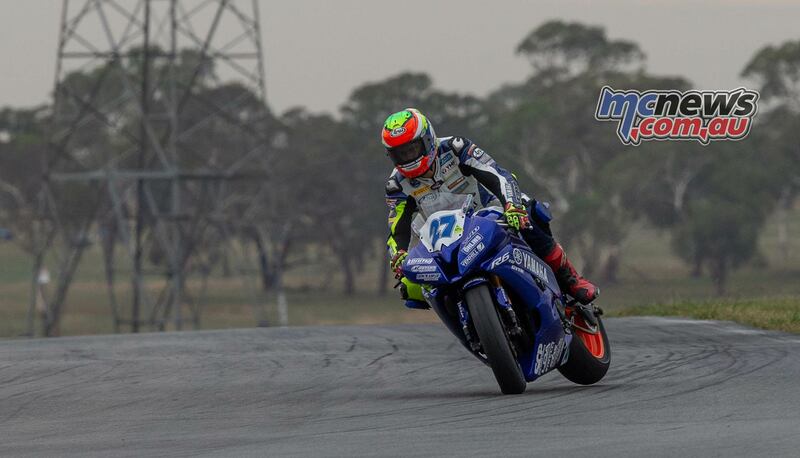 Toparis ran away with proceedings at the Phillip Island season opener, and also dominated qualifying on Saturday. He would be on some very short odds ahead of Sunday morning’s opening 16-lap-bout under cloudy skies. Broc Pearson started from second on the grid ahead of Reid Battye. 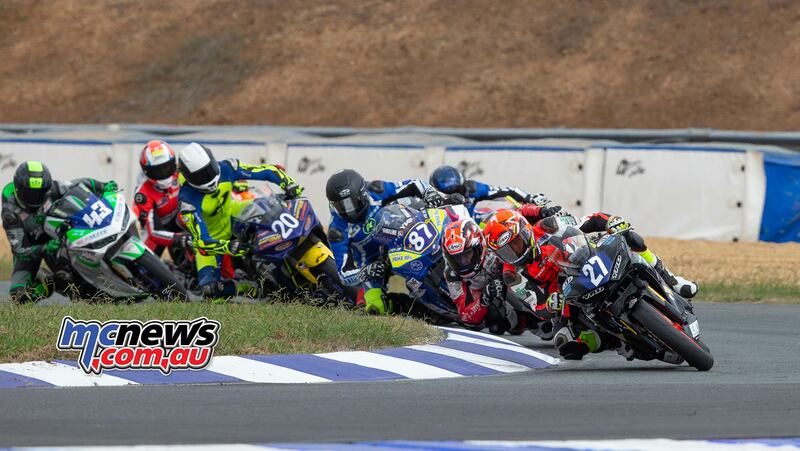 The Suzuki rider splitting a cavalcade of Yamaha YZF-R6 machines to start on the front row. Heading the second row was Oli Bayliss ahead of Nic Liminton and Ty Lynch. 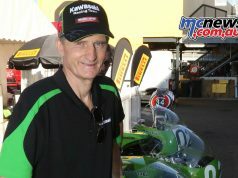 Bayliss had destroyed one of his machines on Saturday morning and was keen to repay the hard work of his Cube Racing mechanics, headed by two-time British Supersport Champion Glen Richards. Bayliss got a ripper start from that second row but was swamped at turn one by Toparis, Pearson and Battye. 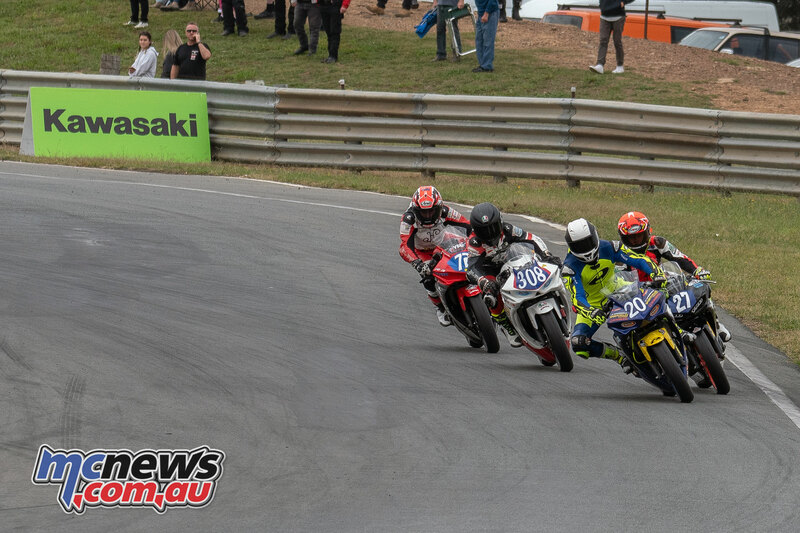 Bayliss got back up to third place a few turns later, pushing good mate Pearson back to fourth. By lap two Toparis had started to stretch away from his pursuers but that top four all put in 60.2-second times on their first flying lap. On the next lap though Ty Lynch set a new fastest lap of the race. Then on lap four Reid Battye went quicker again and it started to look as though there would be no escape act for Toparis today. 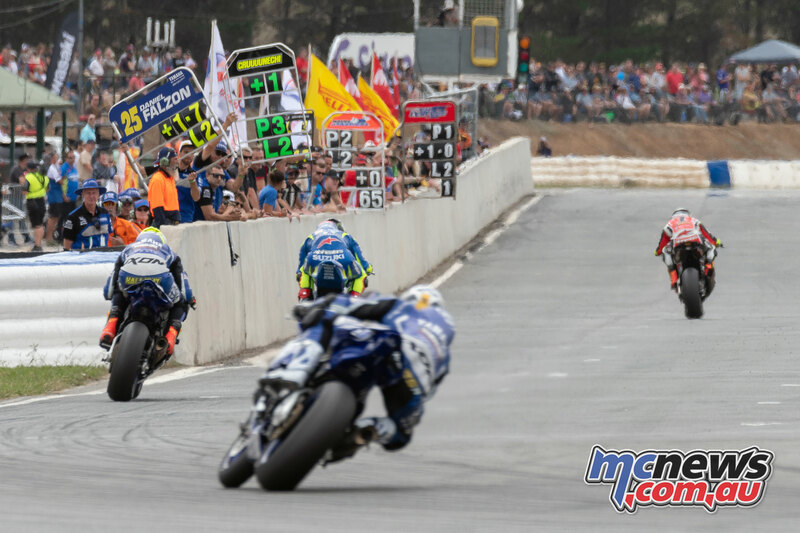 Ecstar Suzuki’s Battye was really taking the challenge up to Toparis but a mistake with 11-laps to go allowed Bayliss and Pearson to push him back to fourth. 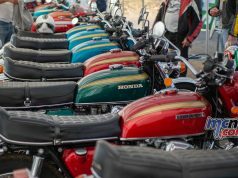 Their tussle also gave Toparis a little more breathing space, the local lad responded with a 59.575 to set a new race lap record and pull away. Pearson and Bayliss then started to dust each other up. Pearson backing it in under Bayliss from way back as they set-up for the final double-right to move up to second place as they reached half-way distance. With five laps to go Pearson gained a few bike lengths over Bayliss as young Oli was forced to relent his chase, less he throw the bike down the road in his quest to battle Pearson, who looked to have more speed here this morning. After Saturday’s destruction, perhaps the lack of a fully-fit spare machine also in the back of Bayliss’ mind. A great battle was unfolding between Reid Battye and Ty Lynch for fourth place but then with three laps to run Lynch got in a little hot trying to squeeze past Battye and was left to rue what could have been from the kitty litter. At the last lap board Toparis had a clear four-second lead over Pearson, who in turn now had three-seconds over Bayliss. And that was the order they were in at the chequered flag. Toparis taking a clear victory and Pearson putting in a great performance to take second place. Pearson was the only rider other than Toparis to dip under the magic-minute mark. A 59.83 for Pearson plays Toparis’ best of 59.57, but in the post-race interviews Pearson was pumped and confident that if he could get a better start that he could run with Toparis here this afternoon…. Reid Battye was very strong early on but faded quickly. His Suzuki looking not to be steering all that well on exit thus perhaps his tyres were quickly burned up from his early pace. South Australian Nic Liminton claimed fifth on an almost ten-year-old bike after his new bike lunched his engine early on in the weekend. John Lytras started well but then rolled to a stop with a mechanical failure of some sort early on the opening lap as Max Stauffer led Ben Baker and Zac Levy around lap one. Baker though got in way too deep as they started lap two and lost a number of positions. 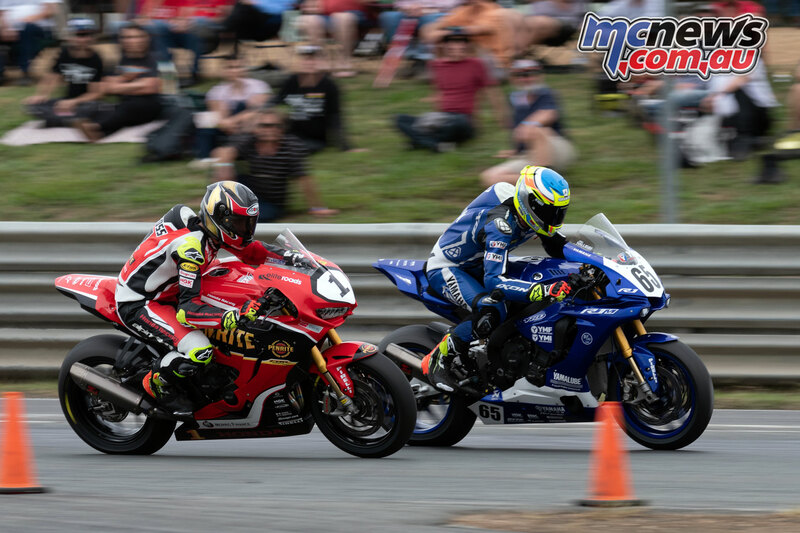 Zac Levy was taking the battle up to young Max Stauffer in the early stages of the race, the pair regularly swapping places at the front of the field. Locky Taylor had his head down to try and join that party, setting the fastest lap on race three, a 66.424, to stretch away from Seth Crump and Ben Baker. Taylor backed that up with a 66.590 on the next circuit to declare his challenge by arriving onto the tail of Zac Levy. Unfortunately a lap later the race was declared after a red flag was produced to stop proceedings due to a downed rider, Ryan Smith, requiring medical attention at the Fish-Hook. That left Max Stauffer was the winner from Zac Levy and Locky Taylor. 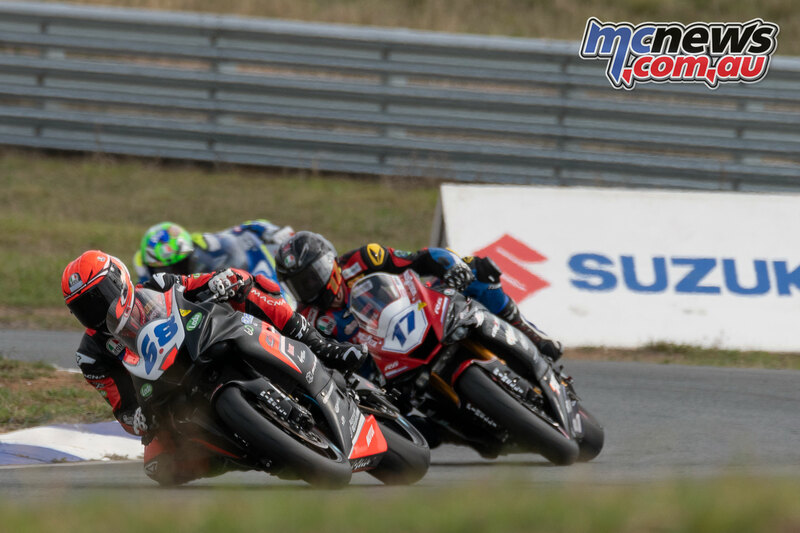 Race One dominating trio Max Stauffer, Ben Baker and John Lytras again quickly broke away from their pursuers in the opening race on the Sunday schedule. 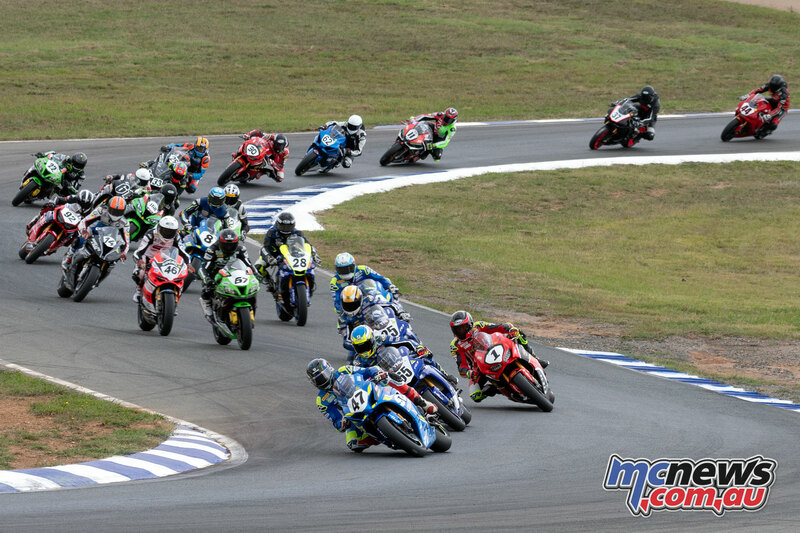 That triumvirate finished 1-2-3 in Saturday afternoon’s opening YMF R3 Cup race of the weekend, but Baker was given a 10-second jump-start penalty which saw him demoted him down to ninth place, and promoted Hunter Ford on to the podium. 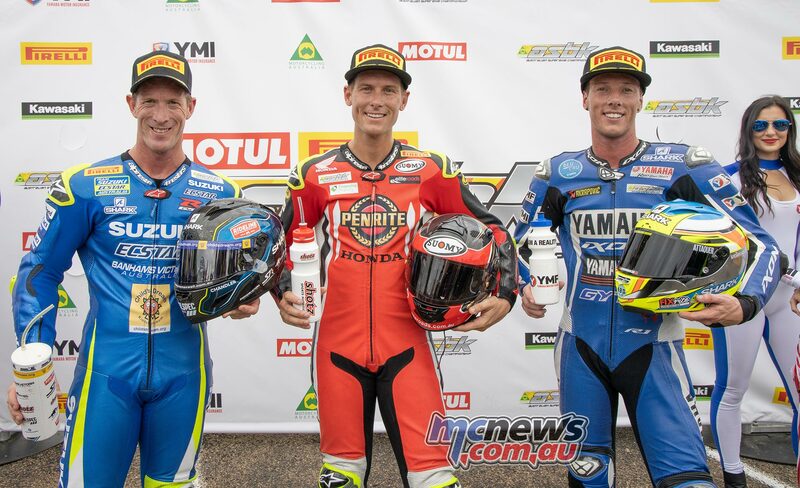 This time around Ford was keen to take it up to that trio here on Sunday morning and managed to tack on to the back of them as the race progressed. John Lytras took the lead at half-race distance but Baker then got him back on the entry into turn one. A lap later Hunter Ford started to get stuck in and mix it up proper with that more diminutive trio. Ford always suffers a little due to his larger frame but still managed to win the championship in 2018, and broke the lap record again, a 65.706, to briefly take the lead before Max Stauffer slipped past him once again as the battled hotted up for the last lap. Max Stauffer though proved himself the wiliest cat among the pigeons to once again take victory. Hunter Ford right on his tail and John Lytras managed to claim the final step on the rostrum ahead of Ben Baker. 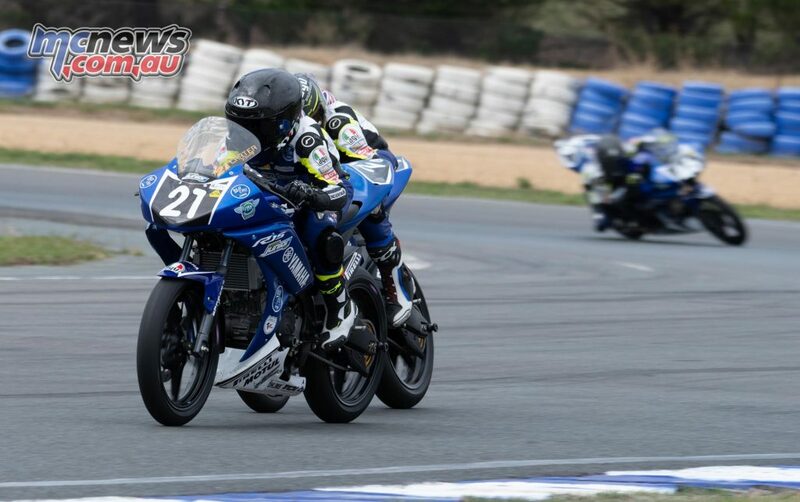 Staking that first claim on Saturday afternoon was 11-year-old Carter Thompson, the first ever race winner in the bLU cRU Oceania Junior Cup when the inaugural six-lap bout was contested on Saturday afternoon. Carter Thompson started Sunday morning as he finished Saturday afternoon, at the front of the field. Cros Francis thought was quickly all over him through the back sections of the circuit but Thompson got the better of him through the kink to get back in the lead. Their pursuers were Marianos Nikolis, Jacob Roulstone and Angus Grenfell. As the race progressed Thompson and Francis started to stretch away from those chasers though. Their own two-way battle though really hotted up on the penultimate lap. Cros Francis slotted through to the lead early on the final lap, kept his nose ahead until the fish-hook, then it was Thompson back in front and managed to keep his nose in front all the way to the line to make it two-from-two.